LAWRENCEVILLE, GA – After one-hundred-fifty years of classes, gatherings and graduations, the College of the Holy Cross decided it was time to repair and restore its signature building and icon of the college, Fenwick Hall. 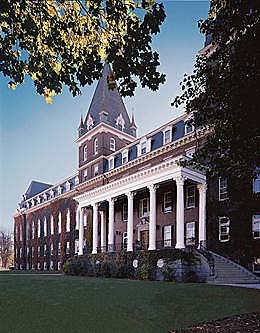 Years of harsh weather and use of antiquated products contributed to the deterioration of the building, but mostly, to the deterioration of the authentic Roman Corinthian wood columns featured on the Fenwick Hall porch. Melton Classics™ has completed replication and restoration projects throughout the country with quality products including authentic wood columns, fiberglass columns, poly/marble columns, and synthetic stone columns and balustrades. For your next restoration project, contact Melton Classics™ for information on their complete line of column and balustrade products.